How to buy Polish online course ? Take advantage of a convenient purchase creator, which will lead you through the process of purchasing Polish course online and will redirect you to safe payment website in three steps. Choose the language version of the course (English or Russian) and currency of the payment (PLN, EUR, USD) in the purchase creator (scroll-down list). Tick the course title which you want to buy (section - Choose courses). Then choose the course level from a scroll-down list. Then accept the terms and conditions of the service and click on Order. In step 2 you register or log in. Step 3 summarizes your order, confirms and redirects to online eCard safe payment webpage. If you are interested in a detailed description of the purchase creator, check How to buy. You may also pay directly to our account. Put the title of a course which you want to access and your e-mail address as the bank transfer name. If you want to gain the access faster, send us the bank transfer receipt and we will confirm your login and password to the platform. In the bookmark Prices and Payments you will find data which is necessary for a bank transfer. How to buy single Polish online lesson? Single Polish online lesson may be selected from the course Polish for special occasions. Take advantage of a convenient purchase creator which will lead you through the process of purchasing lessons and will redirect you to safe payment website in three steps. Choose the language version of the lesson (English or Russian) and currency of the payment (PLN, EUR, USD) in the purchase creator (scroll-down list). 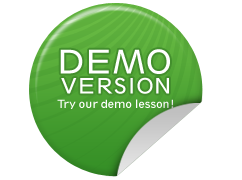 Click on the green arrow to scroll down the lesson titles in the purchase creator (section - Choose lessons). Tick one or several lessons (1-10). Then accept the terms of conditions of the service and click on Order. You may also pay directly to our account. Put the title(s) of lesson(s) which you want to access and your e-mail address as the bank transfer name. If you want to gain the access faster, send us the bank transfer receipt and we will confirm your login and password to the platform. In the bookmark Prices and Payments you will find data which is necessary for a bank transfer. How to gift Polish lesson or Polish course online to my friend? If you would like to gift Polish course or Polish lesson to your friend, choose the bookmark "Bought as a gift" after choosing a course or/and a lessons (Creator, step 1) in the second page of the creator. Fill in your details appropriately, depending on whether you have your own account or you are in the middle of registration. You may put some personal information in the field under the details of a person you send your gift to. If you want to remain anonymous, tick the field "I want to remain anonymous". After filling in required information click on Next. Step 3 summarizes your order, confirms and redirects to online eCard safe payment webpage. A person will receive a message about the gift and a login with password to the platform. She/he will know who is the lesson or course from or the you will remain anonymous. She/he will also read additional information from you, if you placed it in the form. How a company or an institution can buy Polish online course for en employee/employees ? contact us at cservice@polishonlinenow.com to arrange the access to courses and receive a preform receipt. After the payment for the course is settled, we send logins and passwords and we issue invoice. purchase online using the purchase creator. During registration it is necessary to give employee's details, company's address and tick "VAT invoice" (this option is convenient if you want to purchase for one person). We deliver reports and statistics, if necessary. When will I get the access to my Polish online course ? Authorization of online payment takes place automatically. That is why when you pay by credit card, electronic transfer or by PayPal, you will get the access to a course in several minutes. Settlement of payment outside working hours can be extended in several banks. If you pay by traditional transfer, settlement time varies, but usually does not exceed 1 working day (transfers are not effected at weekends and during holidays). A similar situation may occur when paying at a post office. If you want to get your access to a course faster, send us your bank transfer receipt. How much time will it take to finish my Polish online course ? One course consists of 30 lessons with 25 screens of training content on average. you will finish the course in 4 weeks. you will finish a course in 10 weeks. you will finish a course in 15 weeks. 4 months of access to the course guarantee appropriate comfort of learning, so you can finish subsequent parts of the material at your own pace. On the other hand, it motivates you to systematic work. You can come back to a selected lesson any time. We recommend revisions. Take advantage of teaching aids: prints, language rescue kits, gifts and work cards. Learning will become more effective and more interesting. The section Why & How includes more information on learning methods. What technical requirement do I have to fulfil ? Hardware: PC computer; RAM memory (min. 256 MB), graphic card (resolution min. 1024 x 768); sound card; headphones or loudspeakers. Software: Operating system: Windows (98 or higher), Internet browser (IE 7.0 (recommended) or higher, FireFox 2.0 or higher), installed Adobe Flash Player plug-in (8.0 or higher) and Windows Media Player. 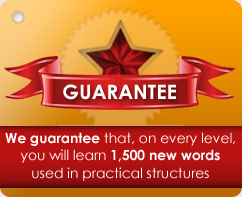 Will I receive a certificate after finishing my Polish online course ? Yes. Access to a certificate print will be available after achieving 65% of correct answers from a test (lesson 30 of every course).